A Dangerous Question: Does Internet Advertising Work at All? The Internet was supposed to tell us which ads work and which ads don't. But instead it's flooded consumers' brains with reviews, comments, and other digital data that has diluted the power of advertising altogether. Nineteenth-century retailer John Wanamaker is responsible for perhaps the most repeated line in marketing: "Half the money I spend on advertising is wasted, the trouble is I don't know which half." Today, marketers are grappling with the Wanamaker Paradox: The more we learn which half of advertising is working, the more we realize we're wasting way more than half. Perhaps you're nodding your head about now. Most people you know don't click online ads. At least, not on purpose. But now research is getting closer to quantifying exactly how few people click on Internet ads and exactly how ineffective they are. It's not a pretty picture. Take search ads, which have helped Google become the richest advertising company in the history of the world. Search ads are magic, in a way. Throughout history, most ads have been imprecise branding. You're watching TV or reading the newspaper, and you're interrupted by marketing—Samsung's new thing is shiny; Ford F-something-something can drive through dirt; Blah blah blah GEICO—that has the staying power of a snowflake in an oven. But search catches consumers at the moment they're actually looking for something. It shrinks the famous "purchase funnel" to its final stage and gives us tailored answers when we're asking a specific question. That's the theory, at least. But a new controlled study on search ads from eBay research labs suggests that companies like Google vastly exaggerate the effectiveness of search. For example, consider what happens when I look up a brand, like Nike. An ad for Nike.com appears just above an organic link to ... Nike.com. Campaigns like this have "no measurable short-term benefits," the researchers concluded. They merely give consumers a perfect substitute for the link they would have clicked anyway. 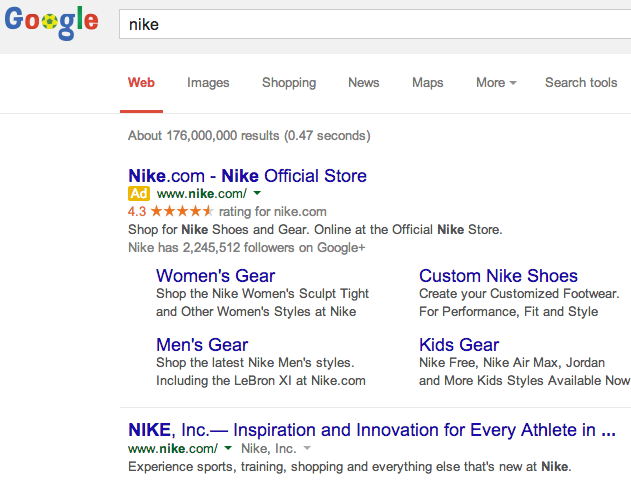 (The only way it would add value is if Nike is paying to keep a rival like Adidas out of the top slot ... assuming Google would sell Adidas the top sponsored link on searches for "Nike"). But what about more common searches for things like "buy camera" or "best cell phone," where many different companies are bidding to answer our queries? A well-placed search ad ought to grab curious consumers at the peak of their interest. But in a study of search ads bought by eBay, the most frequent Internet users—who see the vast majority of ads; and spend the most money online—weren't any more likely to buy stuff from eBay after seeing search ads. The study concluded that paid-search spending was ironically concentrated on the very people who were going to buy stuff on eBay, anyway. "More frequent users whose purchasing behavior is not influenced by ads account for most of the advertising expenses, resulting in average returns that are negative," the researchers concluded. I'm not fully convinced that search ads are as ineffective as this paper suggested. To their credit, the authors admit that other studies about Google have found search to have higher ROI. But the big idea behind their research is powerful. Academics call it endogeneity. We can call it the I-was-gonna-buy-it-anyway problem. Some ads persuade us to buy. Some ads tell us to buy something we were already going to buy, anyway. It's awfully hard to figure out which is which. Enter Facebook, the second-biggest digital ad company in the U.S. Just as Google is synonymous with search, Facebook is ubiquitous with social. The News Feed is the most sophisticated content algorithm ever. The company represents the spine of so many apps and sites that it can marshal an astonishing (and growing) amount of data about us. While Google can convert consumers at the bottom of the purchase funnel, Facebook is more like TV, a diffuse broadcast of stories where some companies hope to interrupt our lazy attention with branding messages. In 2012, Facebook partnered with Datalogix, a firm that measures the shopping habits of 100 million U.S. families, to see if people who went on Facebook and saw ads for, say, Hot Pockets, were more likely to go out and buy Hot Pockets. According to Facebook's internal studies, the ads weren't getting many clicks, but they were working brilliantly. “Of the first 60 campaigns we looked at, 70 percent had a 3X or better return-on-investment—that means that 70 percent of advertisers got back three times as many dollars in purchases as they spent on ads,” Sean Bruich, Facebook’s head of measurement platforms and standards, told Farhad Manjoo. There are a few reasons to be skeptical when Facebook concludes that its ads are working spectacularly. First is the basic B.S.-detector blaring inside your soul saying you shouldn't automatically believe companies who say "our research has apparently concluded unambiguously that we are awesome." Facebook, ad agencies, and ad consultants all benefit from more ad spending. These are not objective parties. Second, there's that pesky I-was-gonna-buy-it-anyway bias. Let's say I want to buy a pair of glasses. I live in New York, where people like Warby Parker. I've shopped for glasses at Warby Parker's website. Facebook knows both of these things. So no surprise that today I saw a Warby Parker sponsored post on my News Feed. Now, let's say I buy glasses from Warby Parker tomorrow. What can we logically conclude? That Facebook successfully converted a sale? Or that the many factors Facebook considered before showing me that ad—e.g. : what my friends like and my past shopping behavior—are the same factors that might persuade anybody to buy a pair of glasses long before they signed into Facebook? Maybe Facebook has mastered the art of using advertising to convert sales. Or maybe it's mastered the art of finding people who were going to buy certain items anyway and showing them ads after they already made their decision. My bet is that the answer is (a) somewhere in the middle and (b) devilishly hard to accurately measure. The eBay study suggested that people who click most ads aren't being influenced. The Facebook study suggested that people who are being influenced aren't actually clicking ads. It makes you wonder whether clicks matter, at all. In fact, there's reason to wonder whether all advertising—online and off—is losing its persuasive punch. Itamar Simonson and Emanuel Rosen, the authors of the new book Absolute Value, have an elegant theory about the weakened state of brands in the information age. Corporations used to have much more control over what kind of information consumers could find about their company. The signal of advertising was stronger when it wasn’t diluted by the sound pollution of the Internet and social media. Think about how much you can learn about products today before seeing an ad. Comments, user reviews, friends' opinions, price-comparison tools: These things aren’t advertising (although they're just as ubiquitous). In fact, they’re much more powerful than advertising because we consider them information rather than marketing. The difference is enormous: We seek information, so we're more likely to trust it; marketing seeks us, so we're more likely to distrust it. Simonson and Rosen share an anecdote from 2007: Ten thousand people around the globe were asked if they'd want a portable digital device like the iPhone. Market research concluded that there wasn't sufficient demand in the U.S., Europe, or Japan for an such a device, because people liked their cameras, phones, and MP3 players too much to want them mushed into one device. Today the iPhone is the most famous phone in the world, not just because its ad campaign was so great, but because the user reviews of the phone were overwhelmingly positive and so widely disseminated. Measuring and predicting individual purchases has never been easy. But measuring and predicting how everybody's purchase is affecting everybody else's shopping behavior in the Panopticon of the Internet is practically impossible. The Internet was supposed to tell us which ads work and which ads don't. Instead, it's flooded consumers' brains with reviews, comments, and other information that has diluted the power of advertising. The more we learn about how consumers make decisions, the more we learn we don't know.